Buffalo’s Dualie is two things in one. 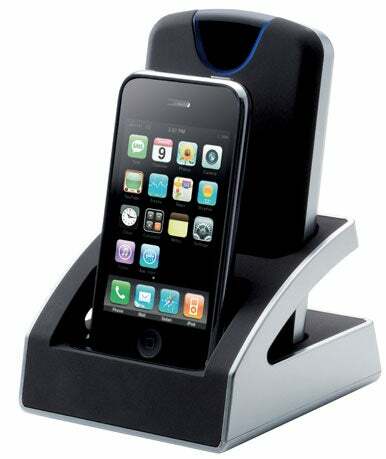 It’s a dock for your iPhone or iPod and a dock for a Buffalo triple-interface portable 500GB hard drive. The Dualie cleverly cuts the clutter on your desktop by reducing the number of cords you’ll need; you simply plug in the Dualie with one USB cable. The Dualie's hard drive is a respectably fast, portable, and versatile unit. Yet, if it were not for the included dock, the nondescript hard drive would hardly make waves. The handy dock and hard drive are black with metallic trim. The drive is light, easy to transport, and only slightly wider than an iPhone. You can easily carry your iPhone in one pocket and your hard drive in the other. A stylishly curved blue LED light at the top of the drive denotes activity. While the Dualie dock recharges the iPhone or iPod and connects both the drive and the iPhone/iPod to your Mac, there isn’t actually any interaction between the two hardware devices. You can’t back up your iPhone with the Dualie hard drive, or drag files from one or the other. You could, of course, put the files you want on your iPhone from your Mac and back them up on your Dualie drive. But the lack of interaction may disappoint some people. The Dualie effectively accomplishes two tasks without improving either of them; it may not improve your overall experience for either device. Whether or not you’ll find the reduction in cords and stylish dock worth your time is up to you. Novelty aside, the Dualie comes with a 500GB dual interface hard drive (FireWire 800 and USB 2.0). The drive is a 2.5-inch SATA drive with a rotational speed of 5400 rpm. Buffalo uses Western Digital, Seagate, Hitachi, or Samsung drive mechanisms in its enclosures. In our lab tests, the Dualie offered decent speed scores. Compared to the portable 7200 rpm Elite-AL Pro Mini from OWC, the Dualie had slightly slower copy tests, finishing with its FireWire 800 connection in 28 seconds. The Dualie’s USB and FireWire 400 times were also slightly behind the Elite-AL Pro Mini. The duplication tests were similar: the Dualie’s FireWire 800 time (46 seconds) couldn’t compete with the Elite-AL Pro Mini’s 40-second score. The Elite-AL Pro Mini’s FireWire 400 and USB 2.0 scores were also marginally better than the Dualie’s. While the Dualie and Elite-AL Pro Mini produced copy and duplication tests that were comparable to desktop drives, their bus-powered mechanisms ultimately struggled with our low-memory Photoshop tests. This is not surprising, as desktop drives are built for heavier lifting, but the degree may surprise some users. While it takes a typical desktop hard drive a little over a minute to finish our regime of low-memory Photoshop tests with USB 2.0, it took the Elite AL-Pro Mini 4 minutes and the Dualie 4 minutes, 10 seconds. The difference between the two portable drives became evident when each used their FireWire 800 connection types. The Dualie finished in 3 minutes, 24 seconds while the Elite AL-Pro Mini finished in 2 minutes, 51 seconds-a far superior score. The AJA tests reflected the difference between the two drives, with the two having similar read/write scores with USB 2.0 but the Elite AL-Pro Mini pulling away with FireWire 400 and FireWire 800. At $250, the Dualie has a price per gigabyte of $.50. That’s extremely high, even for a portable drive. Of course, what you’re paying for isn’t just a hard drive, but a docking station. Some may think it’s worth shelling out an extra $50 or so for a dock station that helps clean up your desk. Others will be turned off by the price wonder why they should pay for a slow hard drive coupled with a iPod dock when their USB cord does just fine. The Dualie is available for purchase at the Apple Store only. Based on performance, the Dualie hard drive is decent but by no means speedy. It’s versatile connection types and lightweight design make it a desirable hard drive, but ultimately the value of the drive lies in whether or not you dig the duality of the unit’s functions. If you’re looking for a stylish iPod or iPhone dock and a convenient portable hard drive, the Dualie’s novelty might be able to impress you.